When you can't have bacon, you can still have the smell of bacon! "My sister was selling candles for school and I was making fun of her because they were really girly scents and the idea came to me that there weren't any man-scented candles." 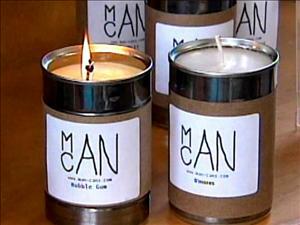 Those are the words of Hart Main, the 13 year old entrepreneur behind Man Cans, scented candles for men. And yes, one of his candle scents is bacon. "We just served 250 cans of soup in a soup kitchen in Lima (Ohio) to get the cans. It was supposed to last three months. It lasted three weeks." Hart makes the candles for about two dollars and fifty cents each and sells them for five bucks. He's sold over 500 so far through local stores and the internet. He says that he's purchased a nice bike with his profits. Smart kid. You can buy your very own Man Can on the Man Can website. Be patient, though, Hart is very busy making these in his kitchen since his story hit the national news! I'm going to order a bacon one tonight. I'll let you know what I think when it arrives!